Measuring 11mm in diameter and providing up to 6.9 tonnes of load-carrying potential, this 11mm 6×36 stainless steel wire rope product is ready for anything. It will overcome challenging outdoor conditions and cope admirably with wear and tear over time. As with all ropes of this particular strand configuration, you can augment the outer bundles of wires by selecting either a fibre core or a classic steel core. The fibre core has a lower 6,390kg load limit, but it is a little easier to manoeuvre and can resist fatigue surprisingly well. The sturdier steel wire core packs a 67.6kN breaking force, along with the same weather resistance as its equivalents across the stainless steel rope family. Rainwater and other moisture will literally run off the surface and leave no signs of corrosion, which improves safety and lessens the likelihood of having to replace the rope early. You might be uncertain about which wire rope to choose. Here at Rope Services Direct, you do not even have to limit yourself to rope constructed from metals; we also supply fibre rope of various kinds, including polypropylene rope and natural fibre rope. Simply pick the rope, select any fittings and we can put everything together, with our array of assemblies putting you behind the wheel. Give the RSD team a ring on 01384 78004, or email them from our site, when you want to order wire rope. Also remember to get in touch for further product details and advice, as we are always here to help. 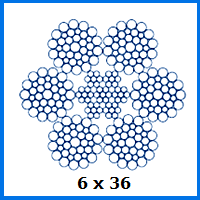 11mm 6x36 Stainless Steel Wire Rope Overall rating: 5 out of 5 based on 6 reviews.